In recent months we have grown so used to seeing Lewis Hamilton driving like a Formula 1 veteran that we have reached a point at which it seems that he simply isn't going to make the kind of mistakes that all Formula 1 rookies make. Like Sebastian Vettel's Safety Car boo-boo in Fuji or any other of the mistakes that new boys have made throughout the history of the sport. But at Shanghai we found out that Hamilton is human. He had the World Championship in the bag (although he will not want to be reminded of this) and as he came into the pits to switch over to dry tyres, he was in the home stretch. The problem was that in the middle of the home stretch there was a corner and Lewis went off. Normally these days there would be grass or high-friction tarmac and a driver can generally get back on the track without too much trouble if his off is at low speed. But on this occasion Hamilton somehow managed to find one of the few surviving gravel traps of the modern F1 era. That was not the end of the world: if a driver is very careful he can sometimes drive through the gravel and get back on the track again. Lewis tried and for a few moments it looked like he was going to succeed. But the dynamics of wet gravel is a complicated and unpredictable science and suddenly the rear wheels began to spin. The momentum was lost and the car was stopped. It wasn't over then. At the Nurburging a similar thing happened and Lewis was rescued and put back into the race by the timely arrival of a crane that hooked him out of a dangerous position and enabled him to rejoin the race. But not on this occasion. The Chinese marshals tried to give the car a push and realised that this was not going to work and eventually Hamilton popped his belts and climbed, rather wearily, from the cockpit. For the first time, Lewis's shoulders seemed a little hunched. "There's still another race left," came word from the bottom of the pile of TV crews. "It was the right decision and just unfortunate. It's my first mistake all year and to do it on the way into the pits is not something I usually do. You cannot go through life without making mistakes. The tyres were finished, it was like driving on ice." In Latin corners of the world there was much rejoicing at Hamilton's misfortune. Not perhaps because they have it in for Lewis himself but rather that they seem to think that he is the representative of the evil dark empire known as McLaren. The Ferrari public relations men have done a good job in that respect but it seemed a little unsporting to be cheering quite as vociferously as they were. But would it not be the same with the British reporters if the Ferraris were off or Fernando Alonso had smacked the wall (again)? And that was the truth. Formula 1 is a sport and sports are about passion and whether we try to be objective or we have favourites is to some extent inevitable. Watching a race and not caring about the outcome is probably worse than cheering at someone else's misfortune. Would we have imagined such a thing as the grid lined up in Shanghai. Lewis looked pretty relaxed as he usually does. Kimi looked like Kimi always does. Fernando had that nervous air he has had around him in recent weeks. It was all building up nicely. There was also rain in the air but it was not the deluge that we had expected. The typhoon was slow in arriving although the clever people who said that it would rain at 1pm were bang on. The trouble was that it stopped again at 1.02pm. The track was still pretty damp however and so everyone went to the grid with wet tyres. The weather could have gone either way and it would, in any case, be a while before the tarmac began to dry out. Hamilton got a nice clean start and drove away from his challengers with Raikkonen hanging on as best he could in the spray and Massa and Alonso held each other up as they scrapped for third place. In the first 15 laps Hamilton created a lead of nine seconds. Raikkonen, Massa and Alonso all went further but that was not unexpected given the fact that the Ferrari had been quickest in most of the sessions before Q3 when Hamilton had worked his magic to grab pole position. His strategy was to get ahead and stay ahead and all was going well. When all four frontrunners had done their pit stops Lewis was still four seconds ahead and was again pulling away. During those stops all of them had kept the same tyres on their cars, knowing that trying to break in new wets would not be a great idea. As the track dried so degradation became a problem and we watched as Hamilton began to search out the wet bits on the race track. It was tantalising because you knew that at any moment there could be rain and the face of the race would change instantly. There were some who had nothing to lose who decided to switch to dry tyres earlier than the others. Others were planning just one stop and needed to stay out until they were sure whether the second half of the race would be wet or dry. And while this was going on the tyres being used were getting tired. Alonso had the legs on Massa and moved ahead when the Brazilian switched to dry tyres a little too early. It might have worked but it was not until the end of the race that Felipe began to gain an advantage and while he set a string of fastest laps in the minutes before the chequered flag he was too far behind by then to make up a place. If you had sat down and tried to dream up the worse possible outcome for the Hamilton's World Championship it would have been hard to come up with one. The World Championship will be a three-way fight with all the complicated permutations that this entails. Without Hamilton the race was rather dull although for a while we had Robert Kubica in the lead and it looked like he may be able to go all the way to the flag in his BMW, having stopped much earlier than the others for his dry rubber. Robert might not have won the race but he was well-placed, but a couple of laps later the hydraulics failed on the BMW and he was left in the lurch. That left Kimi ahead again with Alonso trailing along but making no impact at all. Massa was behind him but also making no impression and so we were able to enjoy a few laps of Jenson Button in fourth, setting a string of fastest laps. Jenson had struggled early on but was then one of the first to switch over to dry tyres as early as lap 24. It was not at all easy but he did some great laps times and was suddenly fourth. He stopped again on lap 42 and dropped to sixth but then moved up to fifth when Giancarlo Fisichella made his final stop - having adopted a similar strategy but with less effect. Button's second stop meant that Sebastian Vettel moved through to fourth. The youngster was driving well, as he did in Japan until his unfortunate demise, but having been bounced down the grid with a penalty in qualifying he had decided on a one-stop strategy rather than the more aggressive two-stop plan which team-mate Tonio Liuzzi went for. The weather worked out almost perfectly for Sebastian and he was able to switch to dry rubber, just when it needed to be done. There was a hint of rain and then the track began to dry. It was not easy and Heidfeld, for example, went to wets at about the same time as Vettel was switching to drys. The same happened to Webber. His Toro Rosso team-mate Liuzzi was able to get home in sixth place as well, despite the fact that the weather ruined his strategy. In the early laps of the race he was one of the fastest on the track and his strategy was much the same as the other frontrunners with a stop on lap 19. This dropped him back into the pack but his path cleared quickly and Tonio was fourth and stretching his wets as far as they would go (as was Hamilton at the same time) and he lost time to his immediate rivals. He pitted on the same lap as Hamilton but kept it on the road and was on his way with dry tyres in eighth place. As others pitted he moved up to sixth. He was then passed by Fisichella but when the Renault stopped he was sixth again and there he stayed holding off Nick Heidfeld all the way to the flag. It was a classy drive. "I think Sebastian's one-stop strategy was better," he said, "but that does not matter now. It is fantastic for the team that we both scored points. I made no mistakes and had some great fights with Williams, Renault and BMW. I don't think we could have done more than this. Many times this year, we have shown that we were capable of scoring points, but somehow we never got them. Now everyone can be happy and it shows that the team is growing and that all the guys are doing a great job." 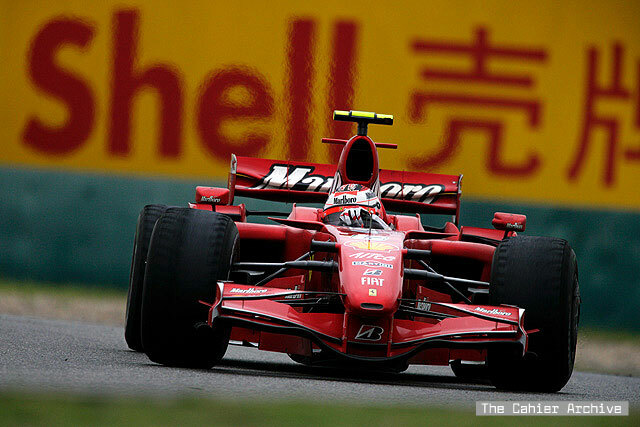 The last point went to David Coulthard who ran a solid one-stop strategy, despite pressure at the end from Kovalainen. And so ended an unexpected race and we were left working out the permutations for Brazil.